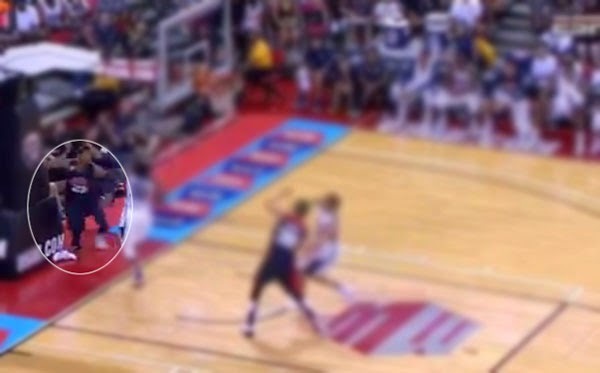 ESPN reported that his leg landed and buckled at the base of the basket stanchion after challenging James Harden's fast break layup at 27 seconds to go in the fourth quarter. George's injury was reminiscent of what happened to NCAA player Kevin Ware. Fans watching the match were shocked and initially speechless. Minutes later, they started chanting his name hoping that he will stand up, but he didn't. The 24-year-old United States national basketball team member was fetched on a stretcher and brought to a medical facility for treatment. Team USA head coach Mike Krzyzewski announced that the scrimmage was over out of respect for Paul George and his family. Because of the severity of the injury, he surely won't see action in the 2014 FIBA Basketball World Cup.